Men usually put a ton of thought into selecting an engagement ring, but most find themselves clueless when it comes to choosing the ring they will wear forever. If this sounds like you, JustMensRings.com is here to help. Our 14k white gold 6mm slightly domed super light comfort ring offers all the elegance of platinum at a much more affordable price. White gold has been a popular choice for wedding bands and other kinds of jewelry. Our men’s 14k white gold 6mm slightly domed super light comfort fit ring is subtly sophisticated yet comfortable to wear. Find your perfect size today! Each 14k white gold 6mm slightly domed super light comfort fit ring we offer is designed for everyday wear. White gold contains approximately 58.3% pure gold by weight and an alloy of metals. That alloy includes metals such as zinc, palladium, silver, or nickel to retain a stunning sterling sheen for years to come. Comfort fit bands are crafted using extra metal to create a domed effect, so they tend to run a half-size smaller than traditional rings. We recommend that you have your ring size measured by a professional jeweler to determine whether a comfort fit band is right for you and your lifestyle. 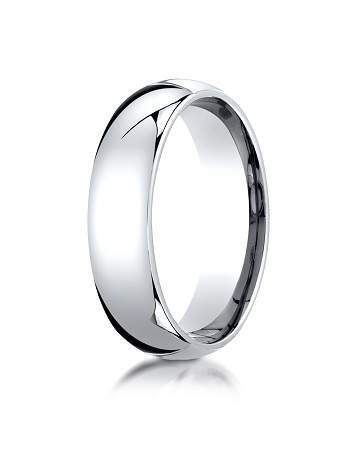 Have questions about our men’s 14k white gold 6mm slightly domed super light comfort fit ring? Please feel free to contact one of our jewelry representatives for additional information.